Article written by Kevin O’Donnell, Esq. A recent study estimated that 60-70% of Americans between the ages of 18-52 have no estate plan. For young couples, this percentage is certainly higher. One reason many young couples fail to plan is that they have not been educated on the value and benefits of proper estate planning. Many believe estate planning is reserved for older, wealthier families, when in fact young couples often benefit more from proper estate planning than these older, wealthier families. When meeting with young couples, I almost always recommend a revocable living trust. Many believe trusts are only used by wealthy families to avoid paying taxes. A revocable living trust, however, is a common estate planning tool used to leave an inheritance to minor children. This article will highlight many of the reasons why a revocable living trust is the best way for a young couple to leave an inheritance for young children if both spouses unexpectedly pass away. All property passing through a will or through intestacy (the rules that apply when someone dies without a will) is subject to probate. Probate is the court supervised transfer of property at one’s death. To initiate the probate process, someone must go to the courthouse and be appointed by the court to transfer the property. This person is referred to as either the administrator or the executor, depending on whether the decedent has a will. At the time of his or her appointment, the executor is required to publicly record your will and pay a probate tax based upon the value of your estate. Next, the executor will collect all of your belongings and file an inventory of your assets with a lawyer appointed by the court called the Commissioner of Accounts. Periodically, the executor is required to file accounting with the Commissioner of Accounts detailing all the actions he or she has taken on behalf of your estate. If the Commissioner finds any mistakes or is unhappy with the accounting he or she will return it to the executor without approving it until it is corrected to the Commissioner’s satisfaction. The executor is then required to use your estate’s funds to pay your final expenses, taxes and verified debts. Once the debts are all paid and the Commissioner of Accounts approves all of the accountings, the executor can finally distribute your property to your heirs or your beneficiaries and close out the estate. It is easy to see why the probate process is unpopular. Probate generally takes between nine months and two years and is a frustrating and inefficient way to transfer property at death. Fortunately, a revocable living trust avoids the probate process altogether. If both spouses unexpectedly pass away without a will, their property would still likely pass to their children under the laws of intestacy. Without a trust in place, however, this property is transferred through the probate process. To make matters worse, if the couple’s children are minors they are not legally able to inherit the property. As a result, the Court must appoint someone to manage their inheritance and the probate process extended until the children turn 18. The property is then distributed outright to the children for them to spend however they choose. Most parents have heart palpitations when considering the thought of their 18 year old inheriting any amount of money without supervision. Wills avoid some of these issues but are still not the ideal way to leave an inheritance to minor children. Most wills include a provision nominating a person (referred to as a “guardian”), to manage the children’s inheritance until they turn 18, but this person is still subject to the probate process. This means the guardian is required to account to the Commission of Accounts each year on how the money was spent on the children’s behalf until the children turn 18. Once they turn 18, the guardian is required to distribute the money to the children despite the fact that they are presumably too young for such responsibility. A will may include provisions requiring the guardian to manage the children’s inheritance until the children reach a later age, but this will extend the probate process even after the children reach 18 years of age. A revocable living trust gives a young couple the best of both worlds. The trust typically names a person (referred to as the “Successor Trustee”) to manage the children’s inheritance if both spouses unexpectedly pass away. The property passing through the trust is not subject to the probate requirements and therefore the successor Trustee does not have to make annual accountings to the Commissioner of Accounts or pay any probate taxes to the local court. Furthermore, everything the successor Trustee does is private and the successor Trustee avoids most of the frustrations of the probate process. A revocable living trust also typically sets rules for the successor Trustee to follow when managing the children’s inheritance. The trust can, for example, require the successor Trustee to retain the inheritance in trust until the children reach an age set by their parents. If the parents have concerns about their children’s ability to manage finances they can require the property to be held in trust until their children reach 30, 40, or even 50 years of age. During that time, the property is still used for the benefit of the children but the successor Trustee has discretion in making decisions about how the money is used. The trust provides flexibility for meeting a young couple’s goals while avoiding the probate process. A trust can instruct, for example, that the trustee preserve the inheritance to pay for college, to pay for the down payment on a house, or to pay for the costs of a wedding. A trust can also be drafted so the successor trustee is either liberal or conservative in making discretionary distributions for the children’s benefit or to provide for specific distributions of property at certain ages. Thus, the trust allows for a young couple to customize their plan to a greater degree than a will while also avoiding all of the frustrations of the probate process. Most couples refuse or fail to contemplate the possibility of remarriage after the death of one spouse. 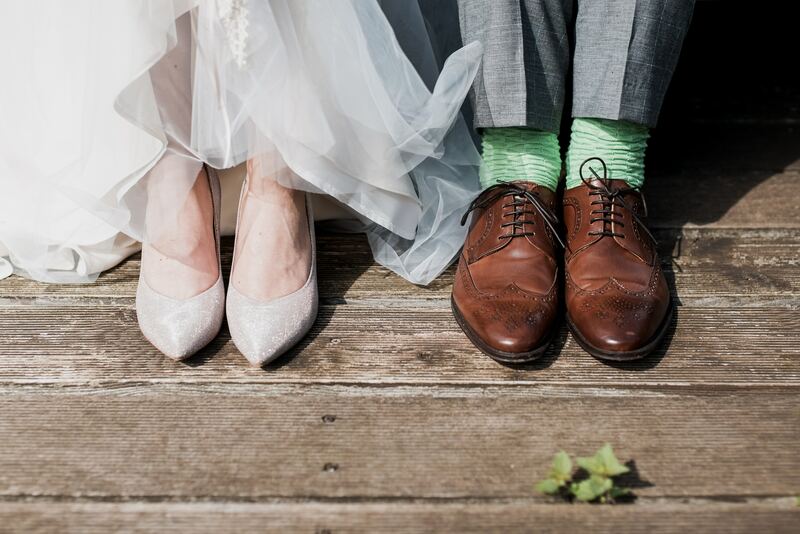 Remarriage is usually the most difficult subject to discuss and often the couple’s response is a terse, “We are not planning on remarrying.” Remarriage, however, is a real possibility which can have some important, unintended consequences for any couple to consider. Without proper planning, a second marriage can result in the unintentional disinheritance of children from the first marriage even under the best of circumstances. To illustrate, let’s use the example of Tom and Ann. Tom and Ann are married and have one son named Jack. Tom and Ann have no estate plan when Tom unexpectedly passes away. Most of their assets were jointly titled and Ann inherits all of Tom’s property. Ten years later Ann meets Mark and Mark proposes. Ann and Mark marry and subsequently have a child named Caleb. Ann and Mark meet with an attorney and draft an estate plan that says if Ann dies everything is transferred to Mark if he is alive or, if Mark predeceases Ann, everything is transferred to Jack and Caleb in equal shares. Unfortunately Ann gets sick and passes away. According to Ann’s will, Mark inherits all of her property. Mark has a great relationship with Jack but never adopts Jack. As much as Mark likes Jack, Mark loves Caleb more and updates his will leaving everything to Caleb. As a result, everything that Tom presumably wanted Jack to ultimately inherit after Ann’s death will now be inherited by Caleb through Mark’s will. All of the parties in this scenario acted with the best of intentions and yet Jack still ended up being unintentionally disinherited. Tom and Ann likely never considered this scenario. But, this example demonstrates why it is an important factor to consider, especially among young couples. Ann can, through the use of a revocable living trust, ensure Mark inherits her property while also ensuring Jack is protected if Mark remarries. Ultimately, a good estate plan accomplishes two things. First, if done properly an estate plan provides a young couple with peace of mind knowing there is a plan in place to protect their children in the event of a tragedy. It is hard to put a dollar value on the peace of mind a good estate plan can provide, especially for young couples with young children. Second, a good estate plan provides a great lasting legacy for your loved ones. If tragedy strikes, your children will have the benefit of a plan in place to ensure they can avoid the frustrations of probate. More importantly, a good estate plan allows your children to benefit from an inheritance while also protecting them from their youthful mistakes. If you are interested in hearing more about the revocable living trust, please attend one of our regular seminars.